In the United States, health care purchasers, consumers, and policymakers are demanding improvements in the quality and efficiency of medical care. A promising approach to meet this demand is the development of what is known as a learning health system (LHS). A learning health system has the capability to continuously study and improve itself. Among many types of benefits it can bring about, the learning health system makes it possible for providers to make faster and better decisions about which treatment options would produce the best outcomes for patients. Today, the Michigan-based stakeholder initiative, Learning Health for Michigan (LH4M), is proposing the use of a learning health system approach to address persistent health care problems in Michigan. Unwarranted and costly hospital readmissions—which are discussed in this paper—are one example of a problem that could benefit from a learning health system approach. What is the Learning Health System? In 2015, the Institute of Medicine (now, the National Academy of Medicine or NAM), defined the learning health system as one in which science, informatics, business, and culture strengthen the link between generating new clinical evidence and using it to continuously improve health care delivery 1. Learning health systems use many types of data to generate new insights into how to improve the quality of care, and then directly apply new approaches, derived from these insights, that can lead to better health outcomes. Targeting specific health problems, they do this repeatedly so that improvement occurs over successive cycles of study and change. By providing actionable information to a broad range of stakeholders such as physicians, nurses, social workers, patients, payers, and others, learning health systems can be particularly effective in tackling hard-to-solve health care problems2. 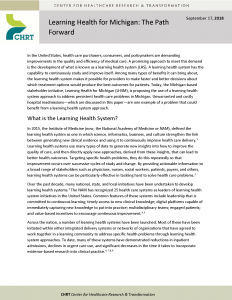 In 2013, the Center for Healthcare Research and Transformation (CHRT) convened a group of patients, clinicians, researchers, public health professionals, and payers to discuss ways to apply the idea of the learning health system at a state level: to turn Michigan into what might be called a “learning health state.” The initiative was named “Learning Health for Michigan,” or LH4M. Later convenings of the LH4M stakeholder group were organized by the Michigan Health Information Network (MiHIN) Shared Services and the Department of Learning Health Sciences at the University of Michigan Medical School. Michigan has many resources that are key ingredients for a state-wide learning health system. One of the most innovative is the Knowledge Grid (KGRID) 10, a digital resource that stores the results of analyses, pertinent to particular health care problems, and makes advice from these results available to inform healthy choices and decisions. The KGRID helps ensure that, for example, the results of predictive analytics 11can be put to immediate use. Designed to be interoperable across multiple information systems, the KGRID can compute data from various systems and predictive models to compare and evaluate which models are most useful in practice. The KGRID is an asset for further development of learning health systems in Michigan, and offers an opportunity to reduce costs and improve quality by addressing complex health problems of interest such as the troubling problem of unnecessary and expensive hospital readmissions. Since 2012, Medicare’s hospital readmission reduction program (HRRP) and private payer initiatives have encouraged the development of many new strategies to improve the quality of care for recently discharged patients with the goal of preventing their fast return for an inpatient stay. Today, health systems throughout the country are tackling readmissions problems. For the most part, they are doing this individually; and there does not appear to have been significant, systematic improvement in these rates. For example, Michigan’s average statewide hospital readmission rate for all payers has not significantly decreased since 2013. In a 2018 learning health systems forum, the Michigan Hospital Association reported that data from the Michigan Inpatient Database shows readmission rates held steady at 14% within the last 5 years. One reason may be that there is no mechanism to share lessons learned from these individual initiatives and apply them systematically across the state. This is exactly what LH4M can make possible. Another reason for the unchanged readmission rates may be that health systems have relied upon data, primarily claims-based, that took six months or longer to be shared and analyzed. Now Michigan’s statewide health information technology infrastructure, including MiHIN and the KGRID, has the capability to share data almost in real time, analyze it, and generate recommendations. These advances in health information technology make it possible for the state’s health systems to combine their data, enabling more rapid and accurate predictive analytics on a statewide scale. Preliminary work combining the KGRID and the resources of MiHIN paints a picture of what might be possible. If we develop a model that can predict readmissions, and work to do that is already underway, that model can be stored in the KGRID. Using admission, discharge, and transfer (ADT) data from MiHIN, each patient’s likelihood of readmission can be “scored” at the time of discharge. In the cases of patients with high likelihood of readmission, real time notifications can be sent to providers who are then advised to take anticipatory or corrective action, using specified treatment protocols. Instead of a focus on 30-day readmission rates, monitoring readmission rates within less than 48 hours or within seven to 14 days may result in more actionable data. Currently, these ADT messages are generated for 96% of Michigan’s 134 acute care hospitals, so this service can be readily deployed statewide. Here is how a learning health system for readmissions can learn. The system can track which treatment protocols were applied to each patient and also whether the patient was readmitted and when. This allows study of which treatments proved most effective in preventing readmissions, which can lead to adoption, modification, or discontinuation of protocols based on actual experience. Interventions that prove effective are retained; less effective interventions are modified or discontinuedIn this way, a learning health system approach would pair new evidence with real-time statewide data from dozens of hospitals and health systems, allowing payers and providers to make up to date comparisons on the effectiveness of a broad range of treatments. In the United States, over 800,000 medical studies are published each year, but it takes close to two decades for new clinical findings to be put into practice.13 To share evidence and make rapid predictions on a statewide basis, large quantities of data from all around the state have to be utilized and incorporated into a learning health system platform. This requires collaboration on a scale rarely seen across health systems. It would entail careful discussions about ways to safeguard patient information, and ways to exchange data across proprietary platforms and services. In addition, the results of these statewide data analyses need to be shared with, and discussed by, subject matter experts around the state. Hospitals and health systems already use data-driven tools to predict which patients are at highest risk for hospital readmission.14 What providers are missing is the actual mechanism to put this knowledge to work: to intervene to help those at greatest risk, based on the most recent evidence available. KGRID would be able to incorporate the latest evidence-informed practices and automatically generate a score per patient to show the likelihood of readmission, and which treatment options are best for that person to prevent re-hospitalization. KGRID would be able to compare interventions that worked for similar patients across hospitals and health systems in the state. Knowing not just who to target, but how to treat them, would be a big step forward in the path to preventing hospital readmissions. The barriers are not insurmountable, but they are sizable and significant enough to require Michigan health, human services, and health information technology policymakers–such as the Michigan Department of Health and Human Services and the Michigan Health Information Technology Commission–to convene stakeholders (the start of a learning health system learning community) to develop a strategy to move forward. Currently health systems are working to improve health care quality within their own institutions by building siloed data infrastructure–an endeavor that is both costly and time-consuming. While some have seen measurable impact in their systems, the state itself has not seen overarching improvements. While Michigan has seen statewide improvement as a result of the state’s Collaborative Quality Initiatives, 15 these systems are limited to specific clinical domains, such as individual surgical specialties, and the data and infrastructure generally are not shared among them. LH4M stakeholders propose that Michigan health organizations across the state work together to convene a learning community to address priority health problems of interest with a learning health systems approach, giving serious consideration to readmissions as an initial problem to address. Utilizing common infrastructure, such as the Knowledge Grid, could enable the state to accelerate improvements on a host of complex health challenges. In addition, the individual efforts of each health system will improve more quickly if there is a common infrastructure that supports analytic and implementation work. Michigan’s statewide health information technology infrastructure is unique in the country not only for its scalability and interoperability, but for its growing capabilities to generate actionable knowledge that can be used to inform decisions and target interventions that ultimately improve human health. In the example case of readmissions, there is an opportunity to reduce unnecessary re-hospitalizations, improve patient care, and lower health care expenditures by capitalizing on this infrastructure. 16 Share DA, Campbell DA, Birkmeyer N, Prager, RL, et al. How a regional collaborative of hospitals and physicians in Michigan cut costs and improved the quality of care. Health Affairs. 2011; 30(4). [published online April 1, 2011.] https://doi.org/10.1377/hlthaff.2010.0526. Machado-Aranda DA, Jakubus JL, Wahl WL, Cherry-Bukowiec JR, et al. J Am Coll Surg. 2014 Nov. [published online June 10, 2015.] https://doi.org/10.1016/j.jamcollsurg.2015.05.006. 17 New Survey: Women’s Health Coverage at All Time High; Affordability & Access Challenges Remain. The Henry J. Kaiser Family Foundation. https://www.kff.org/womens-health-policy/press-release/new-survey-womens-health-coverage-at-all-time-high-affordability-access-challenges-remain/. Published 2018. Accessed August 27, 2018. 18 Hines A, Barrett M, Jiang J, Steiner C. Conditions With The Largest Number Of Adult Hospital Readmissions By Payer, 2011. Rockville: Agency for Healthcare Research and Quality; 2014. https://www.hcup-us.ahrq.gov/reports/statbriefs/sb172-Conditions-Readmissions-Payer.pdf. Accessed August 27, 2018. Institute of Medicine. 2013. Observational Studies in a Learning Health System: Workshop Summary. Washington, DC: The National Academies Press. http://www.nap.edu/read/18438/chapter/1#viii. Best Care at Lower Cost: The Path to Continuously Learning Health Care in America. Committee on the Learning Health Care System in America; Institute of Medicine; Smith M, Saunders R, Stuckhardt L, et al., editors. Washington (DC): National Academies Press (US); 2013 May 10. Savarino JR, Kaplan JL, Winter HS, Moran CJ, Israel EJ. Improving clinical remission rates in pediatric inflammatory bowel disease with previsit planning. [published online July 29, 2016.] BMJ Qual Improv Rep. 2016;5(1). doi:10.1136/bmjquality.u211063.w4361. Forrest CB, Crandall WV, Bailey LC, Zhang P, et al. Effectiveness of anti-TNFα for Crohn Disease: Research in a pediatric learning health system. Pedatrics. 2014 July;134(1). The Knowledge Grid (KGRID) is an open digital platform that was designed to put evidence-based medical practice in computable form to be readily available for widespread use. Predictive analytics are “defined as the use of electronic algorithms that forecast clinical events in real time with the intent to improve patient outcomes and reduce costs.” Amarasingham R, et al. Consensus Statement on Electronic Health Predictive Analytics: A Guiding Framework to Address Challenges. J for Electronic Health Data and Methods. 2016; 4(1): 1163. doi: 10.13063/2327-9214.1163. J. Greene, “Michigan Hospitals cut readmission rates but continue to pay stiff penalties” Crain’s Detroit Business, May 2015. PRISM, developed by Trinity Health and implemented at St. Joseph Mercy Hospital in southeast Michigan, is a patient care risk prediction tool that stratifies adult patients by 30-day mortality risk and identifies which patients are at increased risk for other significant events and poor outcomes https://secure.opns.org/portal/files/9315/0409/5816/Informatics_Flyer_September_2017.pdf). The LACE Index, utilized at several hospitals in Michigan, identifies patients’ risk of death and readmission by considering length of stay, acuity of admission, comorbidities and emergency department visits six months prior to admission. https://greatplainsqin.org/wp-content/uploads/2015/01/Lace-Index-Scoring-Tool.pdf). Englesbe MJ, Dimick JB, Sonnenday CJ, Share DA, Campbell DA Jr. The Michigan surgical quality collaborative: will a statewide quality improvement initiative pay for itself? Ann Surg. 2007 Dec;246(6): 1100-3. doi:10.1097/SLA.0b013e31815c3fe5.